Dumka treasury verdict: Lalu Prasad Yadav sentenced to seven years in prison in fourth fodder scam case - Integration Through Media ....! 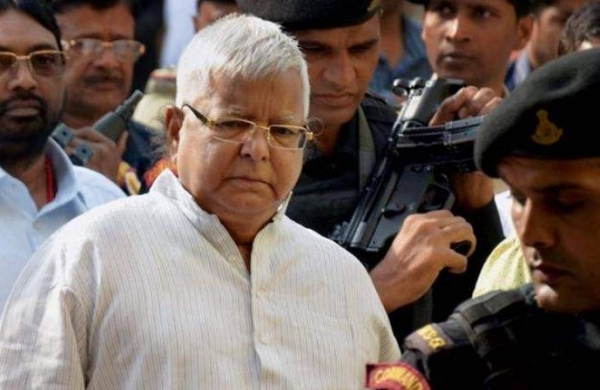 Former Bihar Chief Minister and RJD chief Lalu Prasad Yadav was today sentenced to seven years in prison in the fourth fodder scam case. He was convicted in the Dumka treasury scam on 19th March. Special CBI courts in Ranchi have earlier held Yadav guilty in three other cases of the scam. He was handed a five-year jail term in the Chaibasa treasury case in September 2013; a jail term for three years and a half in the Deoghar treasury case in December 2017; and a jail term for five years in another case linked to the Chaibasa treasury in January last. Last week, Judge Shiv Pal Singh had pronounced Yadav and 18 other accused in the case guilty and acquitted 12 accused. The case (RC 38A/96) pertains to fraudulent withdrawal of Rs 3.76 crore from the government treasury in Dumka, presently in Jharkhand, even though the withdrawal limit was fixed at just Rs 1.50 lakh. Officials of the state animal husbandry department, some bureaucrats of the then undivided Bihar government and suppliers of animal food had colluded with politicians to withdraw the funds from the treasury through 96 fake vouchers between December 1995 and January 1996. Yadav was the chief minister of Bihar at the time. Yadav, who also served as railway minister in the UPA-I government, has been lodged in Birsa Munda Central Jail at Hotwar near Ranchi since December 23, 2017. He was shifted to Rajendra Institute of Medical Sciences (RIMS) in the Jharkhand capital from jail on Saturday after his health condition worsened. Prasad has been in Birsa Munda jail at Ranchi since December 23 last year after being convicted in the second case pertaining to illegal withdrawal of money from Deogarh treasury. The fifth case relating to fraudulent withdrawal of Rs 139 crore from the Doranda treasury in Ranchi is pending with the court.